A few posts ago, I mentioned that I am rehearsing for a Community Theater play. So that is taking up some of my time. But then this wild hare ran by and all the squirrels said "what was that?" You see, for some time I have considered getting a ukulele and learning to play it at least enough to sing along with. Since there is a precedent of buying something and deciding it is "too difficult" or there is some other reason - and I set it aside, I got an inexpensive instrument. 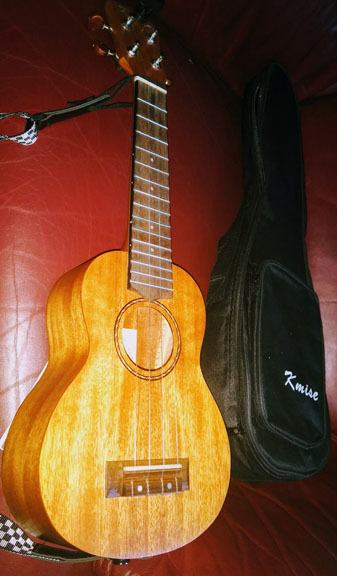 This Kmise Ukulele came from Amazon where the reviews were pretty good. It has a mahogany body (or so it said in the description.) A gig bag (seen above,) a tuner and a strap came with it. So I have been playing around learning chords on it and just having fun with it. Here is another photo with my hand around the neck for size reference. Of course I had to put a quilt in the photo! This little baby is 21 inches long. 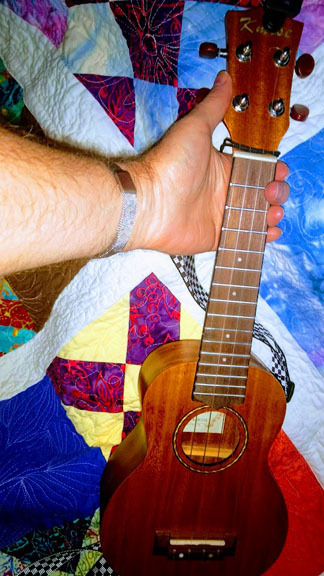 It is a soprano ukulele which is the smallest standard size. The next size up is a concert, then a tenor and the largest is a baritone. 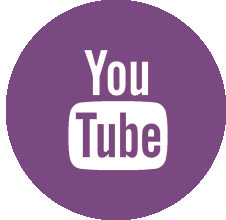 There are an amazing number of tutorial videos on YouTube and other sites that have really been helpful in starting to learn to play. When I get better - and really brave - I will do a small video to share with you. For now, I am just enjoying the journey. No fears, I will be back to quilting and weaving and even painting soon. I can't wait to hear a tune from you! I love the adventures your squirrels lead you on. I know in my own life there is "spill over" from one creative area to another all the time. 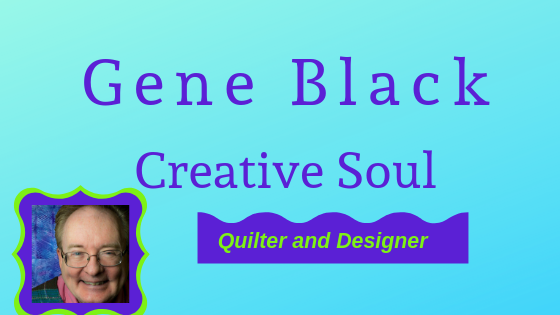 So just because you aren't quilting at this very moment doesn't mean that you won't somehow use what you learn or experience while exploring music or drama in your quilting or weaving some day. Or perhaps it is the music or drama that will be enhanced by your expertise in quilting, weaving, or painting. You never know! Heading toward a 2nd Finish?